Your firm fears no challenge. Your crews will tackle any job and cut through any aggregate that stands in their way, but their performance depends on diamond blades. U.S. Diamond Tools selection of blades and accessories lets you rip through tough materials longer and maintain greater precision all the while. 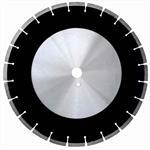 Browse the listings below to find diamond saw blades designed to function well in a broad array of applications. For instance, in addition to carrying standard wet saw diamond blades for concrete, we also supply wet blades for use with green concrete, asphalt and other materials. Discover more by checking out each category or searching for a specific item. We make the blade-sourcing process as painless as possible. Simply choose a listing to learn specifications like compatible saws, segment profiles and ideal work conditions; we even provide recommendations on the types of materials you can cut with each blade model. If you're still having trouble deciding which wet saw diamond blade is the best option for your application, don't worry. You can send us an email or call for recommendations on any product, so dive in below to find your ideal blade! U.S. Diamond has wet diamond blades for any application. Choose premium grade for small to medium size jobs with medium reinforcing. Professional Blades are custom made and offer the best performance in all applications.